“By touching the center of our solitude, we sense that we have been touched by loving hands.” Henri Nouwen. 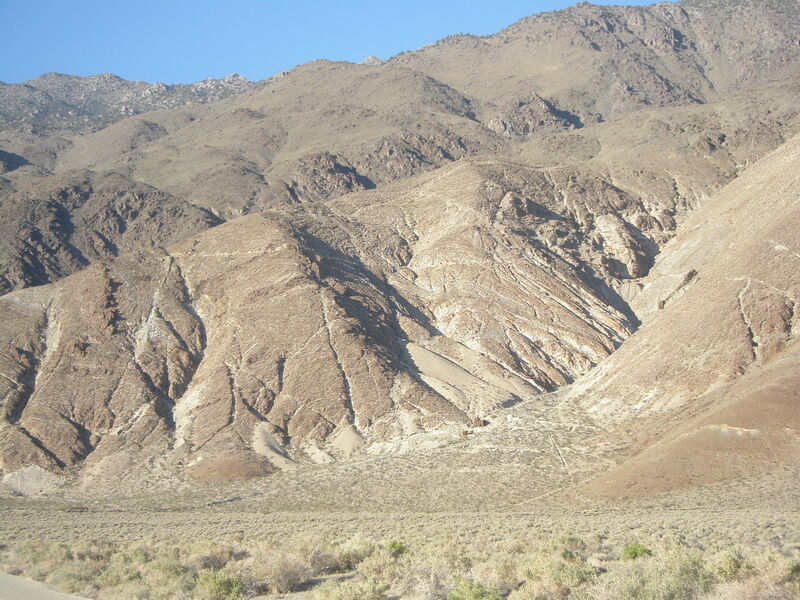 The hot June desert wind buffeted my car as I drove the sandy road east toward the Inyo Mountains. Sun sets early behind the Sierra Nevada. 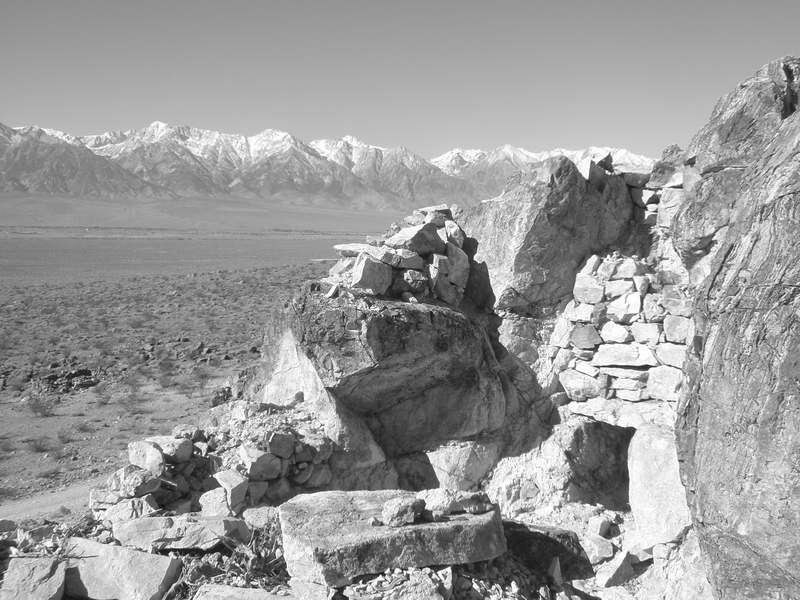 I parked the car at the end of the road, walking toward the stone ruins of a miner’s cabin. I slowly climbed the hillside past spindly branches of creosote brushing against my Levi jeans. As the sun set it was hard to see ahead of me in the looming shadows. Almost there. I reached the old doorway of the cabin. My heart stopped. Loud rattles and hissing. Rattlesnake! This cabin is already occupied! I leaped backwards, rolling down the hillside toward my car. Boy, that was a close one! Thank God for rattles. Of course memory spoke authoritatively: sunset is when the snakes begin to emerge after a hot day in the desert. Summer is not the best time for contemplative desert walks. I normally time my visits between November and March. The following November I revisit the miners cabin. Brilliant sunny day. 50 degrees. 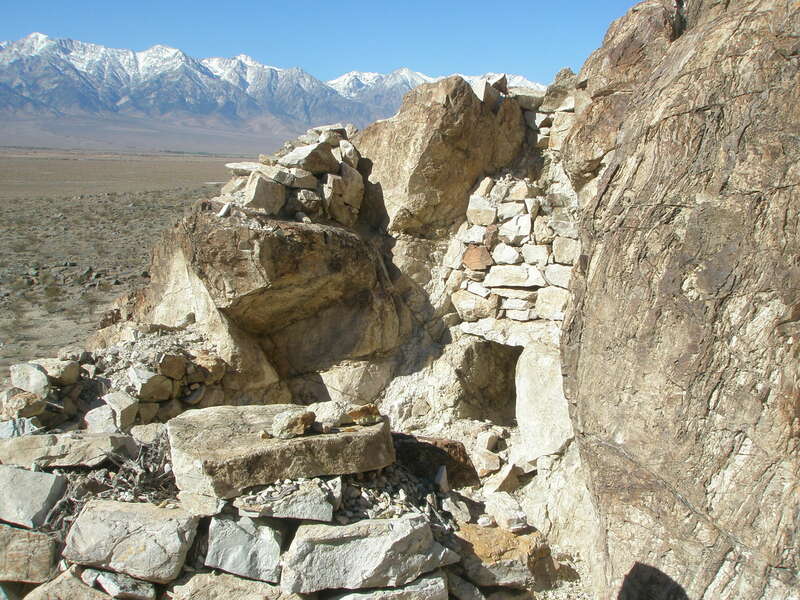 Driving nine miles north of the town of Lone Pine on Highway 395, nestled at the foot of Mt. Whitney, I look for the ruins of the Manzanar Japanese American Relocation Camp on the west side of the highway. On the right a small street sign indicates “Manzanar Reward Road” I turn on to the paved road which runs through the remains of a WWII airfield. Continuing east toward the Inyo Mountains, I cross over the Owens River Aqueduct, which carries away most of the Sierra snow melt toward the thirsty homes of Los Angeles. The road continues past the cottonwood and willow tree lined river bed of the Owens River, recently renewed with a life flow of water from the Los Angeles Department of Water and Power. The paved road ends and I drive through open range. Have to watch out for cows here. In autumn the sagebrush landscape will be thick with the black shapes of Angus cows and tiny clumps of new born calves. The road continues east. I look for a north south ridge of land indicating the remains of the narrow gauge Carson and Colorado Railroad which ran 300 miles north to Carson City, Nevada. I pause at the intersection of this desert road with the ghost railroad bed and imagine the settlement that flourished here in the early 1900s. Before the water was siphoned off, Manzanar was a verdant orchard of apples, pears and peaches. The railroad station at this intersection was where the fruit crops would be shipped. I know that there were also a general store, saloon and one room school house here. But all of this has vaporized in the desert sands. I continue east to a wye in the road. A street sign says “Owenyo Road”, traveling north and south. I continue through the wye, bearing left toward the mountains. The gnarled, folds of the barren mountains reveal scars from volcanic lava flows and violent upthrusts of the earth’s crust. Here is the historic mining settlement of Reward, which has been mined for silver and gold almost consistently since the 1860s. The road narrows and you will see a canyon ravine on the right. I always park my car on a level, open space as the road narrows and becomes very rocky. To the right you will see the ruins of a multileveled mill where the ore was processed. If you look carefully up into the rocky mountainside you will see the remains of a tram bringing the ore down to this mill and a rock lined miner’s trail. I will write more about this in another blog. Meanwhile as you exit your car, look to the left. You will see the ruins of several rock cabins. I walk the road that goes left and around the mountain toward another ravine. Look carefully on your right and you will see rock ruins built into the mountainside. Walk up the hill toward this ruin. The snakes should be sleeping if you visit during the cold of autumn and winter. As you walk around the ruin uphill you will see something marvelous. A carefully constructed rock fireplace. If you enter the ruin you can appreciate the fireplace and the magnificent view of the Sierra through what remains of a window. I love this place. I used to fear being alone. But something changed in my life and I became more aware of the Presence of the Holy One. The desert gifted that to me. So I relish places like this cabin and the solitude I experience here. On this November morning, cold wind stings my ears and nose. I sit on a rocky ledge inside the miner’s cabin. Look at the rockwork. No mortar. Carefully positioned rocks created walls that have lasted 140 years. The fireplace warmed the solitary miner who was sheltered here from wind, snow and rain, collapsing exhausted on his little cot after working 12 hours in the mine. It takes a day to decompress before I come to this place. I realized how much I hunger for this place. How busy our lives are and busy our minds. Cell phones, emails, messages, do lists. It is endless. I am forever anxious about what I haven’t done yet, about whom I have let down, about expectations I create and have not met. As Ron Rolheiser expresses in his book The Holy Longing: we are forever restless and yearning for something. Within that whirlpool of busyness and fatigue and projects that churn our life with restlessness, we yearn for some place of solitude and quiet where we can rest. That yearning comes from somewhere inside us. Soul. Our stomach grumbles to tell us we are hungry. Our soul aches for solitude. We will find a place somewhere, a cabin or condo. The ocean or Palm Springs. We will save the time in our planner. We will pack some food and good books, trying to leave the Iphone and IPad, but then some of our books are on them. Ron Rolheiser writes: “Solitude is not something we turn on like a water faucet. It needs a body and mind slowed down enough to be attentive to the present moment. We are in solitude when, as Merton says, we fully taste the water we are drinking, feel the warmth of the blankets, and are restful enough to be content inside our own skin. We don’t often accomplish this, despite sincere effort, but we need to keep making new beginnings.” (Longing for Solitude, July 1, 2012). Is this what happens to me when the desert quiets my mind and that busy mental computer winds down to a faint hum? Am I remembering this primal embrace of the Holy before I was born? I forgot, but when all is quiet and still, in solitude, my heart warms in this desert space and I remember. Solitude is our helper to remember the kiss and embrace and touch of the Holy. In the business of routine and commitments and responsibilities I forget, you forget. When I sit on the rock in this cabin ruin, dry desert wind flows through my being, the vast landscape opens up spilling out toward the Sierra, I am possessed by this memory. John of the Cross once defined solitude as “bringing the mild into harmony with the mild.” I think that means that we will remember the primal embrace of the Holy One when we enter into solitude and silence. I find that this is the place where I can offer up those inner voices echoing anger, jealousy, frustration, and disappointment. When the desert turns our face to the present moment, we become mild, as St. John invites, and we sense the enfolding embrace of the Holy One which had never let us go. To reach that inner space of peace, joy, love and hope I come out here to the desert. She is the primal womb of most spiritual wisdom. The remembering comes as a surprise. I cannot conjure or manipulate it. But I have to do the work of retreating and journeying to a place set apart. Then in time the wind of the Spirit will catch me and lift me up. The pilot light of memory can be lighted and I can carry that light with me back into the world of projects, duty and responsibilities and become that embrace of God for the whole creation. This entry was posted in Blog and tagged desert spirituality, nature, solitude. Bookmark the permalink.